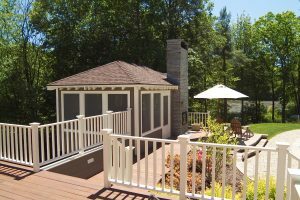 Home Remodeling | Testimonials | Shoreline Builders Inc.
My family and I were fortunate enough to have Jim Wolffer and Shoreline Builders build our dream home. 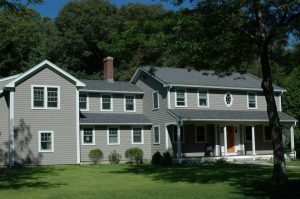 We had purchased our historic home in Hingham with a vague vision of what we wanted to create. We found in Jim the person who could translate that vision into reality. It was by no means, an easy task. Before the first construction truck had even arrived on site, Jim had already gone well beyond our expectations, and our expectations were exceedingly high. It was when we broke ground that Shoreline Builders truly excelled. They worked long hours through a long, snowy winter and deftly managed the very nearby neighbors and challenging worksite. Not once did I find the job site anything but clean, tidy and safe. Jim’s army of sub contractors was as professional and skilled as were his very own builders. They never hesitated to meet me at 6:30am or 6:30pm. Importantly, they were very trustworthy. Simply put, these subs were artisans. Jim effortlessly managed this large project; with ease he navigated the frequently shifting tide of this building process. Challenges and the unexpected naturally arose and he never faltered to keep me in constant communication and to handle the issue expertly. I am the type of person, like most who are probably reading this, demands perfection, completed with efficiency and skill. Jim executed this, from the larges truss to the smallest miter of molding. He was constantly mindful of the cost and longevity of what he created. Importantly, Judy [in the office] was exceptional in managing the complex financial aspects of this process, as she was in constant communication with very detailed and orderly records that made the process transparent and organized. Our home is a showcase of this collective and individual talent. 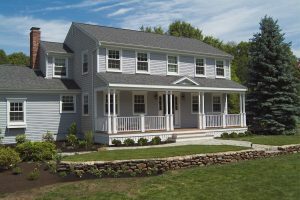 I can assure you that you and your family will benefit from choosing Shoreline Builders more than you could currently know. We just wanted to say how much we love our “New” home! It was a process that started in the heart of the winter and proceeded without ever missing a beat - ending just when you said it would. No one wanted to believe us when we would tell them that we were on time and on budget! There was someone here working every single day…truly unheard of. All the guys were such hard workers and really easy to have around. I actually went through withdrawals when everyone left and I had no one to talk to! It was incredibly helpful to have both you and Steve involved in the architectural drawings stage. We appreciate the attention to detail that everyone associated with Shoreline believes in, it shows in the beautiful window casings and other woodworking, and of course my favorite, the cubbies! We especially appreciated your constant presence here on the job and availability when we needed a question answered. The quality of craftsmanship is clear and we are so happy with the final product. The best moment was when our son said our house used to be no fun to hang out at, but now it is really fun to have friends over. Priceless! We want to formally thank you for the terrific job which you and your team have done in completing construction of our new master suite. From the very first meeting, we have been impressed by your responsiveness and attention to detail. We greatly appreciated the way in which you and Steve approached the planning process. In addition to exploring a wide range of layout and design options, you suggested a number of enhancements that have added to the wonderful appearance of the final product. During construction we were impressed by the professionalism of your craftsmen. Not only did they display a high level of skill, they were great about tolerating our pets and conducting thorough clean-ups at the end of each day. We also valued your regular communications and status reports. Thanks to these, and your well thought-out project manual, we always knew where we stood relative to schedule, cost or work sequence. We are very pleased with the suite you have created for us. It provides all of the amenities that we wanted and reflects a quality of craftsmanship in which we can all take pride. THANK YOU. [You] take more pride in [your] work than I thought was possible. 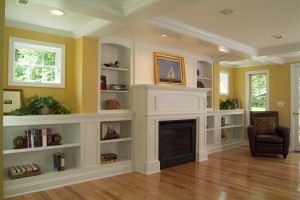 You offered us multiple ideas for a floor plan that met our goals and maintained the overall look of the house. When you are preparing for major home renovation, you get one chance to choose the right people. That can be stressful, but from the minute we decided on Shoreline Builders, we knew we'd made the right decision. You have a keen eye for quality and detail... [Our project] is beautiful and I don't think we could have gotten a better value. It was a terrific experience. One thing that really impressed us is Shoreline's incredible crew and their subcontractors. To a person, they're pleasant to deal with and, I have to add, incredibly fastidious. I would like to take this opportunity to thank you for your fabulous work. We are thrilled with our new house. We have received many compliments from our friends and neighbors, and feel very proud of the new look. We have done a few projects on our home over the past 5 years and we now know what a pleasure it is to have met you and your team. Your professionalism and attention to detail is outstanding. Your crew is also a reflection of your passion for details. We actually miss having them around. As a project wraps up, it is always the "little things" that round up your final opinion of the experience and we want to compliment you on the details that were completed - and more. Your design/ build approach is spectacular, we never could have created on our own, the final product that your team completed. We are looking forward to a few more projects next year to round out our plans and will wait anxiously for you and your crews to be back. We want to thank you for the work, quality and professionalism of our kitchen remodel. We had the utmost confidence in you, as well as the recommendations you gave us along the way. We appreciate all you did to make our project a success. You do amazing work - thank you! We wanted to take a moment to express our thanks for the fantastic job Shoreline Builders did remodeling our home... Through all the snowstorms, rainstorms, wind and cold weather your crew was here every day working on this house. Everyone working for Shoreline Builders was extremely polite and went out of their way to assist us with the building process. Jim, you were always reachable (unlike many contractors) and you helped us make the choices and solve various problems as they arose. We have worked in the real estate business for 28 years, with many contractors, and have never experienced such a polite, dedicated, clean cut professional group of workers. Having now spent four months in our new house, we really appreciate the attention to detail throughout. 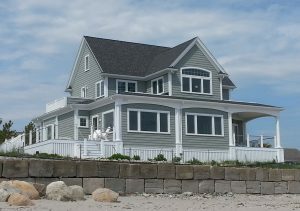 We constantly get comments from neighbors and friends about how beautiful the house looks... From beginning to the end of this complicated process, Shoreline Builders was daily on the job, always helpful, and took a great deal of pride in everything they did. This is something you don't see very often today in the home construction business. Thank you for making our dream house happen! It was a pleasure working with you."